A sober moment (well, not that sober) in Deadpool #35. Deadpool 2 is just days away, and what better way to wait for the film than to dig into the Merc with a Mouth’s comic book backlog? We’ve got some suggestions, but with a twist—these aren’t the hilarious, bizarre adventures that usually star the quirky antihero. These are the stories that explore why Wade Wilson is such a compelling character, even beyond the quips and violence. Deadpool tries to be a hero in Uncanny X-Force #31. Creative Team: Rick Remender, Julian Totino Tedesco, Phil Noto, David Williams, Dean White, John Lucas, Justin Ponsor, Frank Martin Jr., Rachelle Rosenberg, and Cory Petit. It might seem weird to recommend a team book here, especially one where Deadpool is actually a supporting character instead of an overwhelming presence that hogs the limelight (the way he often does when he’s stuck on a team). But the excellent, grim Uncanny X-Force sends Deadpool on a contemplative journey as he rationalizes trying to do good things in very bad ways. While the full series has a lot of good Deadpool character work in it, the final storyline splits a timey-wimey future adventure for the team and a final battle over whether or not the young version of Apocalypse should be killed to save him from turning into his monstrous older self. Deadpool’s role in it is small, but important, and displays a rare somber side to the character that makes it worth checking out. The tree of liberty gets watered in Deadpool #31. Creative Team: Gerry Duggan, Matteo Lolli, Christian Dalla Vecchia, Mike Hawthorne, Ruth Redmond, Terry Pallot, and Joe Sabino. Marvel’s Secret Empire was, overall, not a great event. It consumed the publisher through spinoffs and tie-ins for months on end, and by the time it was over, it didn’t really have much to say that made it worth turning Steve Rogers into an incognito fascist double-agent for the better part of two years. But one of the most surprisingly tragic side stories to come out of the event revolves around Deadpool, specifically his relationship with Captain America. Wade is a man who has always deeply admired Captain America’s idealism, especially as Steve eventually put faith in Wade that few others would, even recruiting him to join the Uncanny Avengers. So when Hydra-Cap comes to Wade with a secret mission that, unbeknownst to Wade, is to help further his plan to have Hydra take over America, Wade willingly toes Cap’s line because he just can’t imagine the possibility of Cap being a bad guy. This small arc shows just how far Deadpool falls in Secret Empire thanks to his faith in Steve, and how he’s forced to deal with that in the aftermath of the event, in a surprisingly touching way. 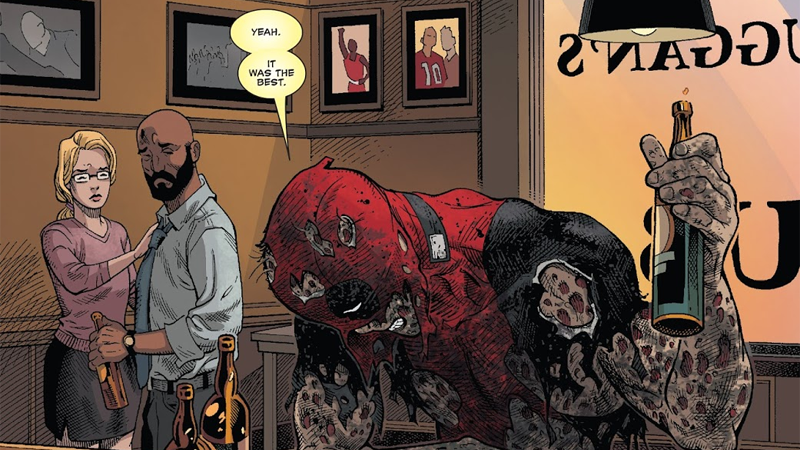 Deadpool finds himself unmasked in Sins of the Past #4. Creative Team: Mark Waid, Ian Churchill, Ken Lashley, Jason Temujin Minor, Bud LaRosa, Tom Wegryzn, Philip Moy, W.C. Carani, Dana Moreshead, Mike Thomas, and Richard Starkings. Deadpool’s second miniseries—before he got the ongoing book where writer Joe Kelly shaped a lot of what is loved about the character today—Sins of the Past is often remembered as being the first time we saw the ravaged body underneath Deadpool’s supersuit. But it also sows the seeds of Wade trying to be more than just a mercenary, by stepping into the world of superheroics. It also gives Wade a more serious side in his relationship with X-Force member Siryn as he tackles the mutant gangster Black Tom Cassidy, and is forced to reckon with one of the people who transformed him into the man he is. Deadpool prepares to face his destiny in Deadpool #23. Creative Team: Joe Kelly, Walter McDaniel, Andy Lanning, Whitney McFarland, Walden Wong, Matt Hicks, and Richard Starkings. Although Kelly’s run on Deadpool’s first ongoing series would go on for a few issues after this arc, “Dead Reckoning” is really the culmination of what Kelly wanted to do with the character. Over the course of the creator’s run, Deadpool is shaped by a shadowy organization into accepting that he will be, somehow, responsible for helping to save the world with the arrival of a being known as Tiamat. It’s eventually revealed that Tiamat is meant to usher in peace on Earth by turning humanity into a mindless slave race, and Deadpool is forced to wrestle with his own free will and the idea of being a hero while stopping Tiamat from brainwashing the world. Deadpool’s struggle in this storyline, and his transition from a freewheeling gun-for-hire to the hero he desperately wants to be, is really touching. It explores the endless violence Deadpool finds himself caught up in, and thought he would have to escape from, to be seen as a hero. Kelly might be remembered as the writer who turned Deadpool into the comedic hyper-violent character fans love today, but his parting shot with this story arc speaks to the depth that Deadpool can be capable of. Creative Team: Brian Posehn, Gerry Duggan, Declan Shalvey, Jordie Bellaire, and Joe Sabino. Posehn and Duggan’s run on Deadpool is likewise known for the duo’s fondness for zany humor and Wade’s quirkier antics, but this five-issue storyline is anything but that. A team-up with Wolverine and Captain America, “The Good, the Bad, and the Ugly” sees Wade captured and detained in North Korea, as the government attempts to recreate the weapon-plus program that gave Cap, Wolverine, and Wade their powers. Although there’s still a bit of lightness in Logan and Steve’s interactions with Wade, it’s really brutal and traumatic stuff at times, and confronts head on the shared suffering these characters went through in their transformations, especially Wade. It’s a reminder of just what a tragic and sad figure he can be behind his comedic defenses, and the story forged the bond between Steve and Wade that the Secret Empire storyline I mentioned above also touches on, so they’re well worth reading as a thoughtful, if surprisingly heartbreaking, duology.